SafeDisc retail DRM no longer functions properly on Windows Vista and later (see Availability for affected versions). SafeDisc v4 DRM[Note 1]. Has both a 2 CD and a DVD version. 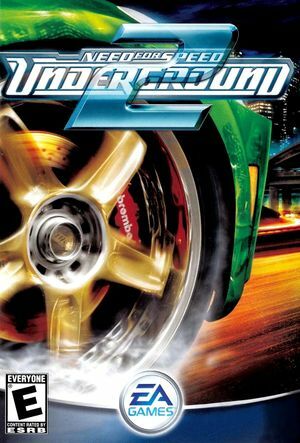 A compilation of the original Need for Speed: Underground, Underground 2 and Most Wanted is also available. Delete or rename ealogo.vp6, FMVOpening.vp6, PSA.vp6, and THX_logo.vp6. Allows playing with both EU and US exclusive cars at the same time. If you have the US version, download Peugeot 106 and the Vauxhall Corsa. If you have the EU version, download Honda Civic and Acura RSX. 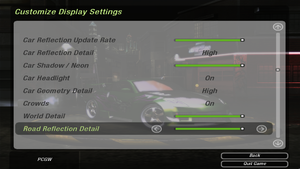 Download Need for Speed Underground 2 Extra Options. Unpack the archive, go to NFSU2 Extra Options\Main Files folder and copy both dinput8.dll file and scripts folder into the installation folder. Make sure that the option Unlock106AndCorsa in scripts\NFSU2ExtraOptionsSettings.ini is set to 1. Use the US executable to launch the game (even if you have the EU version), otherwise it may crash. Key bindings are stored in %COMMONPROGRAMFILES%\DirectX\DirectInput\User Maps (32-bit Windows) or %COMMONPROGRAMFILES(x86)%\DirectX\DirectInput\User Maps (64-bit Windows). Use ThirteenAG's fix and Ultrawide (21:9) Fix. Rain particles are broken when running above 30 FPS. Frame rate is capped at 120 FPS. Use 16:9 Safe Zone to modify the offset values of the HUD elements. ThirteenAG's fix already comes with vertical FOV adjustment. ReLOADeD or Hoodlum US crack is needed. Other versions won't work. FOV changer may not run on modern systems. Extract the main files to the installation folder. Change WindowedMode = 0 to WindowedMode = 2 for bordered or WindowedMode = 1 for borderless. Requires the DirectInput Mapper to remember bindings between sessions. Use ThirteenAG's fix to adjust deadzone. Button mappings will be all over the place, requiring manual remapping. Use ThirteenAG's fix for Xbox/DualShock prompts. 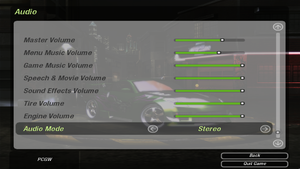 Master, Menu Music, In-Game Music, Speech, Effects, Tires and Engine sliders available. Only Stereo and Mono available. Windows Vista and later lack a file needed for the game to remember custom mappings. Extract it into the installation folder. 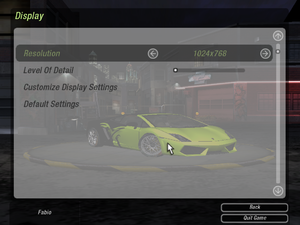 Deadzone can be adjusted in NFSUnderground2.WidescreenFix.ini. Can be caused by multiple CPUs. Some effects, such as rain, car respawn effect or the nos flames, flicker or glitch. Otherwise, no issues. Particle system causes lag, mostly at start of races, turning it off gets rid of the issue. Optionally is possible to disable vsync through video card settings, and keep Particle System on. This page was last edited on 18 April 2019, at 01:43.